Hey guys, I have a 2001 CTD 2500. I also have a set of Hummer H1 beadlocks. For ***** and giggles I bolted one of the bare rims up to my truck and it bolted right on!! Looks like it would work just fine!! My question though is this... I just bought the exact same truck but in 4x4. 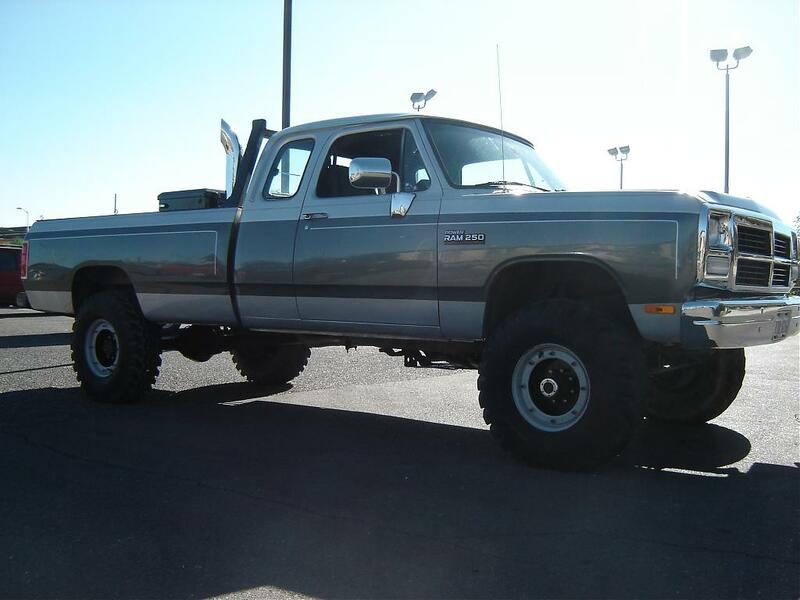 Will these rims bolt on the front dana 60 just fine? They will bolt on, but they have a ton of backspacing, any decent size tire will rub the lower control arm horribly when mounted on those wheels. Theres no lower control arm on a 4x4 right? Also, what if I ran a 1" spacer plate? If you really want to use them, they need to be recentered. There are a couple of companies that will do this ( basically cutting the center out of the rim and rewelding it with less backspacing ), or you could try it yourself, if you have the neccesary tools. A 1" spacer would help but probably not enough, you could run wheel adaptors for dually wheels from a 3500, but that would put the wheel out too far and you would most likely need fender flares to be street legal. A 1.5-1.75" spacer would be just about right for the rear to keep the tire from hitting the inner fender. What size tire are you planning to run? I used to have well over a hundred of these beadlocks laying around and through the process of selling em I learned a few things. One of which is the arm on the knuckle of the Dana 60 that the tie rod attaches to will drag on the inside of the rim if ran with the H1 backspacing. I saw one guy that bought a set grind the arm down to fit. He was running full widths on a Jeep so the backspacing worked out. Otherwise Ive sent just about everyone else to USA6X6 in Oklahoma. They will make any center any way with any backspacing you could dream up. Heres a pic of a set done here on a friends rig. Just a mig welder and patience. Denny, that thing got Wrangler R/Ts on it too? That is a bad truck!! Didn't know they would hit the steering arm on a D60 too, I am trying to remember but I think the stock backspace on them is like 7" or maybe 7.25". Yeah USA6X6 is one of the companies I was trying to think of, I think the other one was Spazworks or something like that. Yep the good 'ol RTII's. 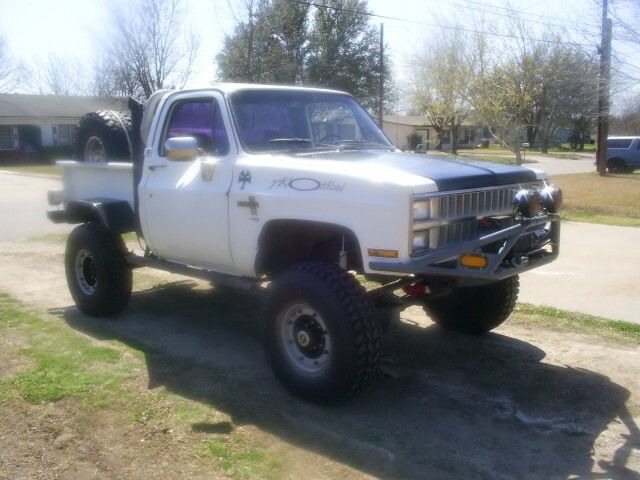 Heres a pic of his other rig with some 37" MT's and a CUMMINS!! The beadlocks look really good when done well. I have a Scout II thats going to get a set. You will read and hear from others that they are not DOT legal and they dont run good down the road and on and on, although they arent legal Ive never had trouble running them on a daily driver nor any trouble with radial tires. I like em, plus they are cheap as all get out. if you order/send a set to USA 6x6 you are looking at probably 8 weeks or more to get them, Dan takes forever with his stuff and it usaully aint cheap, the other company is Stazworks, they aint cheap either. it will be horrible rubbing if you mount the tires on the wheels. dont they always leak down? ***** to mount too...? H1 rims have 7.5" backspace. I've got H2s on my 2nd gen they have 5.5" backspace and they clear everything. you can get 1 or 2 " spacers OR go through the hassle of recentering. H1 rims are DOT APPROVED. I had a set too a few years back. Theres a DOT stamp on each rim. greatlakeoffroad.com sells wheel centers you can weld into the H1 rim. If you wanna try and do it yourself. Sorry to barge in, but I have been looking for a source for these rims, I want the backspacing and found this thread while trying to find the backspacing for stock ram wheels. I am contemplating full widths on my jeep. Here those rims and tires are on the 3rd truck. used them to sledpull 2 years ago then he needed them for the chevy with the 4BT CUMMINS. I have another set of the rims I need to do the centers on and want to put wrangler MT's on it 37's, PS the RT II's are not a real good street tire there fine for a off road rig but thats about it, they dont last long and dont handle a load very well but you can pick up some for about $50 each almost new but you get what you pay for. The 2 pice rim makes it easy to mount your oun tires just take off the 8 nuts holding the out side ring on and the tire just slides off the rim and if you have the run flats it makes them a double bead lock not just a single. These rims have been on my Chevy for 4 or 5 thousand miles and have made two 1,000+ mile trips with no problems. If you have good O-rings then they won't leak down. They are purdy heavy but work well on and off road. Mine are set to 4" of back spacing, I wish they were 3" or 3 1/2" of BS though.